Jai Krishan Kakubhai Shroff (screen name: Jackie Shroff) is an Indian actor. He has been working for four decades (about 40 years) in the Bollywood film industry. He has appeared in about 220 films in various Indian languages, including Hindi, Marathi, Oriya, Tamil, Malayalam, Punjabi, Kannada, Bengali, Konkani and Bhojpuri. In 1983, Shroff made his acting debut in Dev Anand's movie Swami Dada.In 1983, Subhash Ghai gave him a lead (main) role in the movie "Hero," which was a success and brought Shroff to the public's attention. After Hero, he did several films, amongst which were Andar Baahar. Jaanoo and Yudh were successful. In 1986 he did Karma which became the highest-grossing(earning) film of 1986. ↑ "Jackie Shroff profile". 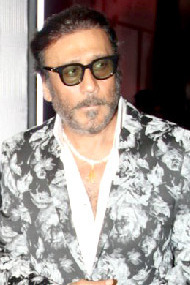 Jackieshroff.in. Retrieved 29 August 2015. This page was last changed on 3 December 2017, at 14:49.